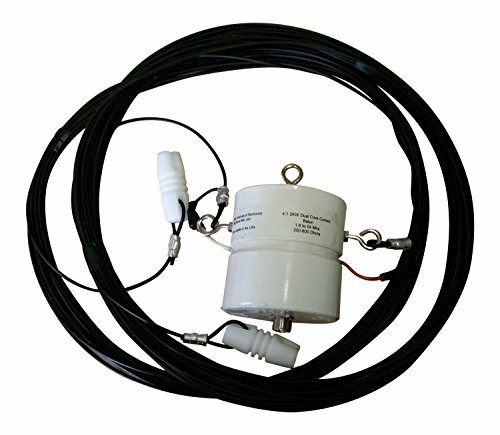 7 Band OCF Windom Dual core Current balun 3KW Flex Weave Antenna HF by Ni4L Antennas & Electronics at Mountain Walk. MPN: OCFDC3KW. Hurry! Limited time offer. Offer valid only while supplies last. The ferrite cores are 2 1/4'' in dim. using 240/61 material. Teflon wire. It is encased in 3 inch pvc round tubing. Stainless steel hardware is used. 7-Band: 75/80, 40, 20, 17, 12, 10, & 6 meters 135 feet (45+90) long. Each balun and antenna is hand crafted, built right here in the USA. Using the best materials. The ferrite cores are 2 1/4" in dim. using 240/61 material. Teflon wire. It is encased in 3 inch pvc round tubing. Stainless steel hardware is used. Double aluminum ferrals are used to hold the wire in place on the balun double machine crimped. The wire used is Flex-Weave 14.